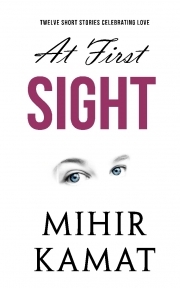 Description of "At First Sight"
At First Sight is a collection of short stories that touch upon delicate relationships in a special way, where each story explores the minds of its characters and how they go about their lives with love playing its part. Join the author as he takes you on a journey into the magical world of love, where even a moment seems precious than a lifetime. Bear witness as a man declares his love for his woman. Feel close to a father's heart as he cares for his newborn child. Or live the life of a grandfather for whom the happiness of his granddaughter means more than the world. Live each story as if it were your own. Mihir Kamat is a first time author but isn't new to writing. He is an avid blogger who dabbles in fiction, poetry and song writing. He loves reading mystery and thriller novels and cooking on weekends. Mihir is currently working on his next book (yet to be titled), a fictional thriller. Reviews of "At First Sight"
I’ve read this book twice since I couldn’t put it down! This is such a well written book and with excellent imagination to make such beautiful stories. I would recommend this to be your next read.